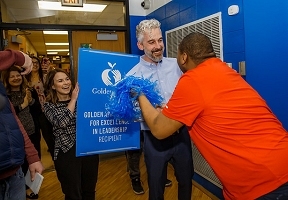 Golden Apple, a leading Illinois nonprofit committed to recognizing exemplary educators and developing future educators, surprised Joshua Long, principal of Southside Occupational Academy in Chicago, with the Golden Apple Award for Excellence in Leadership, presented in honor of founding Golden Apple board member Stanley C. Golder. 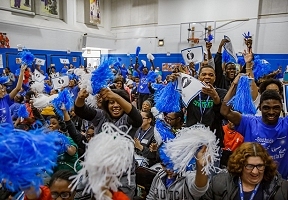 This year marked the first time in Golden Apple’s history that school leaders from all of Illinois were eligible for nomination. 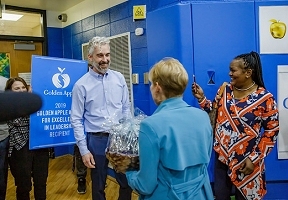 The Golden Apple Award for Excellence in Leadership honors exemplary performance in school leadership by a principal or head of school who has had a significant and sustained positive impact on the school, created a culture of inclusivity, and delivered dramatic student growth. Fellow educators, students, parents, and community members nominate school leaders for the awards. School leaders may not self-nominate.